All of us who make an investment in carpets also bring with us the burden of its cleaning. It’s hard to choose the best carpet cleaning method to avoid damaging the fabric, color and its fresh look. 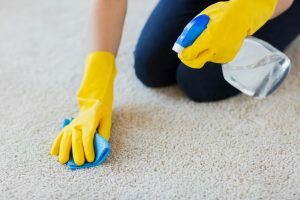 Unlike old methods of splashing and scrubbing water and using toxic detergents, nowadays, there are several modern methods to ease your cleaning chore with an instant yet efficient result in a matter of a few minutes. Below is the review of some of the most common carpet cleaning methods for you to choose from. This is one of the most commonly used methods with no water involvement. The powder form compound absorbs the dirt from the fibers of the carpet, which is then vacuumed up using high suction vacuum to get a spot free carpet. Unlike steam cleaning, this method is applied with very little to no water. This is the newest carpet cleaning method used now. It uses a chemical that has cleaning and crystallization agents which remove the debris or dirt. This is one of the most effective and long lasting methods for carpet cleaning. Have you ever confused dry cleaning with bonnet cleaning? Well, unlike dry cleaning, in this method, a cleaning product is mixed with carbonated water. This is an alternate version of shampooing. Rather than a brush, a bonnet is attached to buffer and dipped into the shampoo solution and then worked into the carpet. This takes up around 30 minutes on average to give you the perfect results. If you get some extra hours, then you can always use foam cleaning for your carpet cleaning solution. Just work the cleaning foam into the carpet with the help of a brush and let it dry for a couple of hours and that’s it. Extract is with a vacuum and it’s done. If you need a more thorough method of carpet cleaning, then steam cleaning is your solution. This is the most recommended method by carpet manufacturers and it involves high temperature steam to penetrate deep into carpet fibers. This also works best for killing microscopic pests. The water is then extracted from the carpet using vacuum drawing which leaves the carpet with a sparkling new look. We know carpet cleaning is essential to get done in time, to avoid further damage. Therefore, such services are now been taken up by experienced professionals like us, at Extra Hands Services, Inc. From cleaning challenges to customized expertly designed cleaning solutions, EHS understands the challenges of carpet cleaning and provides its skilled professional team to give you a fresh experience for the same old cleaning problems. If you still worry about the right solutions for your carpet cleaning needs, then let us take care of them. Get our free consultation for your satisfaction or hire our expertise by reaching out to us at 816-994-8825. Contact us today and let us secure a long term solution to your unique commercial cleaning needs from now onward.